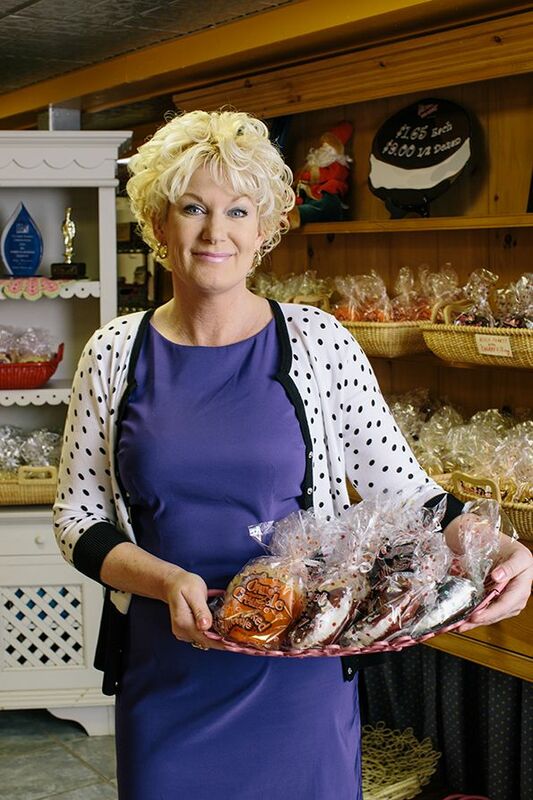 Learn how a former stay-at-home mom grew a home-based baking business into a sweet, $2.5 million success. In fact, Oprah Winfrey’s “people” were considering featuring Wicked Whoopies in the magazine and on the star's hugely popular TV show. Could she send them some for a trial? “I had never, ever shipped product before, and had no experience shipping anything, but I’m not going to say no,” Bouchard recalls. She packaged a set of Wicked Whoopies “better than fine china” and sent them off. The whoopies not only made the show, but were also featured on Oprah.com as a great gift for the holidays. 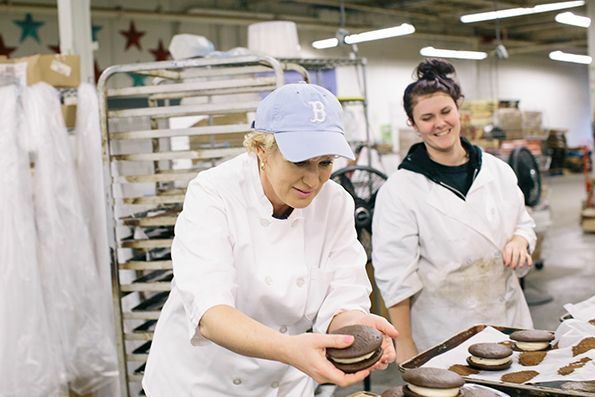 If you’ve never heard of whoopie pies, you’re probably not from New England, where they’re bigger than cronuts. Whoopies are traditionally two round chocolate cakes sandwiched over white frosting. Bouchard claims to be the first to introduce gourmet whoopies in different flavors, such as chocolate chip, banana and red velvet. With the whoopies' moist cake and fluffy filling, “like an inside-out cupcake,” friends and family were wild for Bouchard's treats, she says. In 1994, Bouchard was a stay-at-home mom looking to make extra income. Her brother told her she should try and sell her whoopie pies. 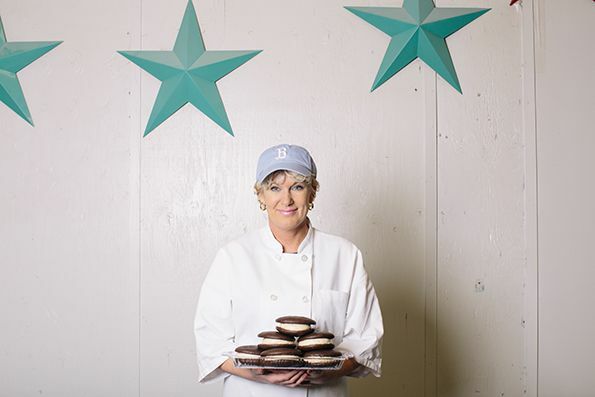 Bouchard remembers thinking that was a crazy idea: Nobody was selling whoopie pies, and she had no business experience. But she loved to bake, and she figured she had nothing to lose. So every day she got up at 4 a.m. to bake. When her son Maxx went to school and her 18-month-old daughter, Isabella, woke up, she’d do her deliveries. (The company, Isamax Snacks, is named after her two kids.) She knew she had something special when she found customers waiting for her to show up. 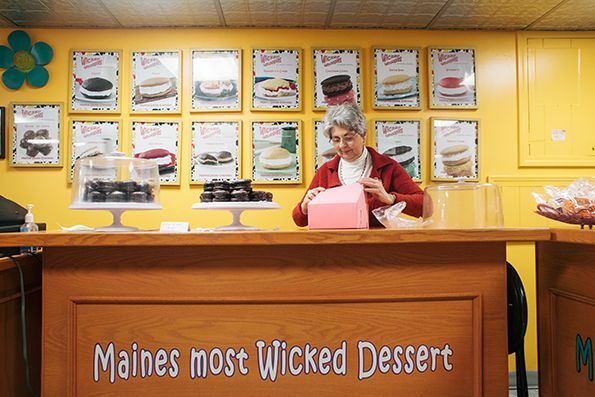 Word spread about Bouchard’s Wicked Whoopies—in New England, “wicked” is a synonym for “awesome”—and demand for her product grew. She was making a dozen pies per hour, and burned out four motors on four mixers. Within two years Bouchard knew she had to stop, or get into a bigger space. The main challenge was financing: Bouchard was turned down for her first Small Business Administration loan. She sought help from the nonprofit SCORE on her business plan. With a stronger plan—and with her whoopie pies in tow—she got the loan on her second try. Bouchard used that money to move Isamax Snacks and its Wicked Whoopies into an 1,800-square-foot facility, which became the bakery. After that first loan, Bouchard made it her practice to set goals every year, whether it was to get 10 more corporate accounts or grow sales by $20,000. "I'm proud to say that every year that I set a goal—and I didn't think they were unrealistic goals—I was able to reach [it]," she says. She also chose to grow the business slowly. "I did turn down opportunities that came my way if I felt that I couldn't take care of the account," Bouchard says. She took every account "very, very seriously," even if it was a small account. "They helped me get where I am today," she says. Shipping became an important part of the business after the Oprah exposure, followed by an Associated Press story and a spot on Good Morning America. Now online sales comprise about 20 percent of the business, with the rest coming from wholesale accounts and retail. When Isamax began shipping, it started by shipping just one flavor—the Classic. "I never wanted to get too overwhelmed with having to ship too many flavors until I had the hang of what I was doing," Bouchard says. "Plus, I wanted to make sure there was a demand for what I was doing." She and her employees wrap the whoopies in "way too much" bubble wrap, and have never had a shipping disaster. To keep the pies fresh from the East Coast to the West (and everywhere in between), Isamax ships them out frozen. Every package arrives within three days, and the product stays fresh for seven to 10 days. 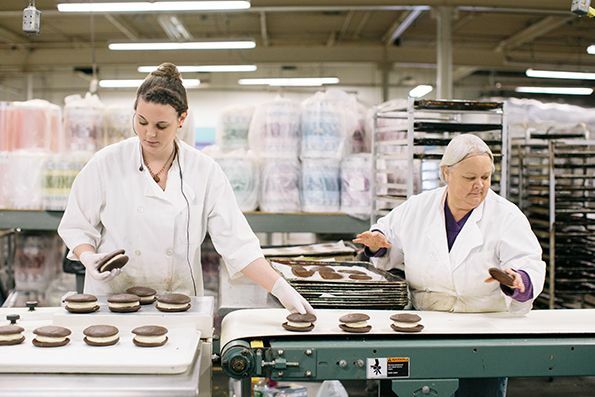 In 2006, the company moved the bakery from its 1,800 square-foot space into an 18,000 square-foot former wool mill, where they bake five days a week. 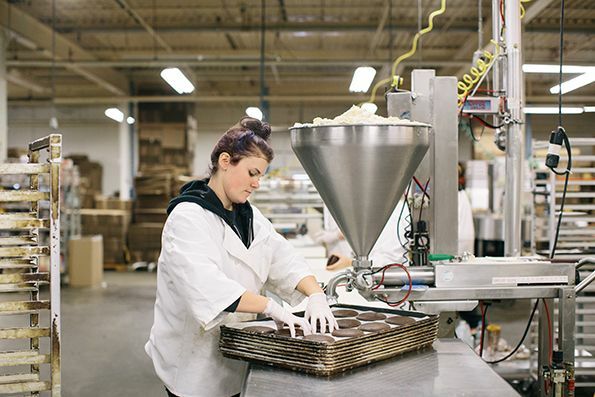 Isamax has 30 employees, who help churn out an average of 12,000 pies per week. 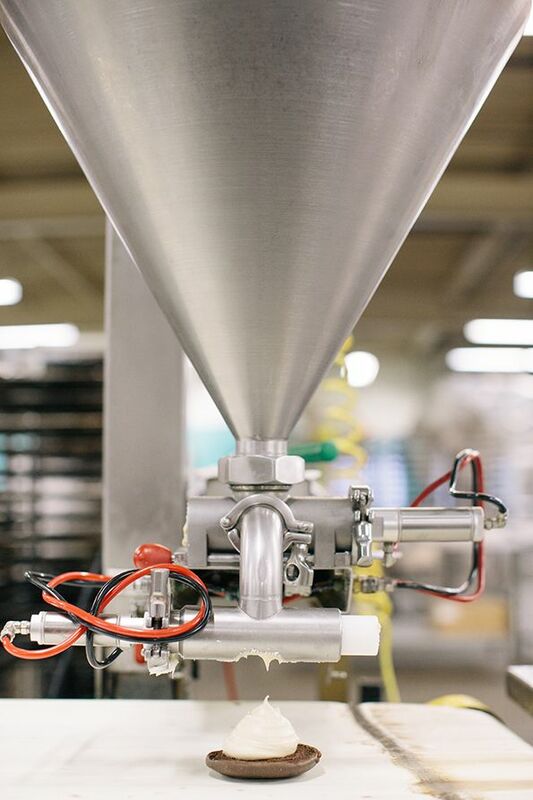 The baking process is semi-automated, with employees running batter through a depositor and manually taking trays in and out of the oven. “We can make 70 dozen in 30 minutes,” Bouchard says. With plans to change their ovens in the next few months, they’ll be able to double that amount in about half the time. In the beginning, Bouchard did all the hard work herself: the baking, the distribution, the bookkeeping. "I can totally sympathize with any distributor, or any small businessperson working 20 hours a day," she says. "I've been there. I know."